Norwegians are consuming increasingly less fish and twice as much salt as recommended. The health authorities want a closer cooperation with the food industry. A recent report from the Norwegian Directorate of Health shows that every Norwegian in average eats 75 lbs (34 kg) of fish per year. The consumption has gradually fallen for several years, and went down with 2.2 lbs (1 kg) per capita from 2010 to 2011. At the same time meat consumption increased from 163 – 165 lbs (74 to 75 kg) per capita per year. One reason for this trend may be that the availability of fresh fish is relatively poor and expensive compared with meat products. The authorities believe that excessive intake of high-fat dairy products and meat makes Norwegians consume too much saturated fat. The unhealthy fats make up 16 percent of the total energy content of food. The recommended level is 10 percent. – It would be an advantage if fish consumption increased rather than consumption of meat, said Acting Health Director Knut-Inge Klepp when the numbers were presented this morning. He believes it is a paradox that Norwegians are eating increasingly less fish in the “Fish Nation Norway”. 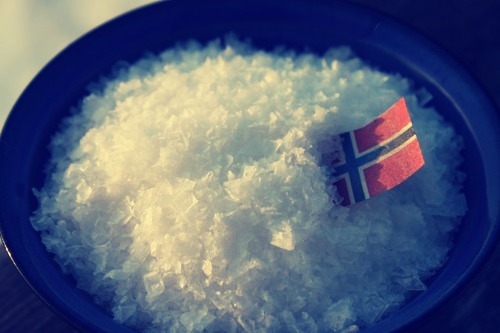 But the health authorities main concern is the large quantity of salt Norwegians eat. In average, every Norwegian eats 0.35 oz (10 g) per day. That’s twice as much salt as recommended, and a major risk factor for cardiovascular disease, which is the most common cause of death in Norway. Most of the salt we consume comes from processed foods and prefabricated products. The health authority’s goal is to cut the salt intake in the Norwegian population. On the positive side, the report states that the Norwegian people eat more vegetables and less sugar than ever before. Although the intake of fruits and berries fell slightly from 2010 to 2011, we ate 4.4 lbs (2 kg) more vegetables in 2011 compared with the year before. In total, Norwegians consumed 355 lbs (161 kg) of fruit and vegetables in 2011. – This is a welcome development that will provide health benefits. Fruit, berries and vegetables are important in the diet because they can help to prevent some types of cancer and heart disease, Klepp says.